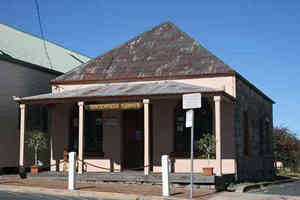 The town of Tenterfield has several parks with creeks, weeping willows, and other magnificent trees. There are well-maintained amenities blocks and a large leash-free area for dogs. Following mapped walks(map available from Visitor Centre) close to the town centre will reveal many stately old wooden and brick houses, the Old Courthouse, Police Station with gaol, the Railway Station, St. Mary's Church, the beautifully built Convent and much more. The area surrounding the town has State Forests and National Parks. The Mt.McKenzie lookout is situated high above the town, providing magnificent views. Golf tours - can be arranged with The Tenterfield Golf Club. Play on 5 top courses. Brochure available from the Club. 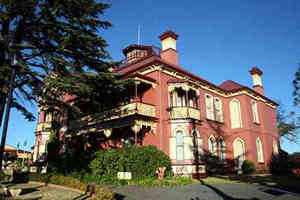 The Tenterfield course is reputed to be one of the prettiest in New South Wales. Visit one of the beautiful National Parks or State Forests.Bald Rock, Boonoo Boonoo, Girraween, Sundown, Tooloom, Basket Swamp are all within easy or comfortable driving distance of Tenterfield. Lyre birds, kangaroos, wallabies and platypus are all to be seen in their natural environment among pockets of ancient rainforest and vast stands of stately eucalypts. Kurrajong Downs Winery Visit the Web site. DRAKE:Originally a mining town surrounded by gold mines, still popular for fossicking and fishing. Today, remnants of these early gold mining days can still be seen. The township is nestled in a picturesque valley surrounded by mountain ranges. Panning for alluvial gold in creeks in the Drake district affords a day that is fun for the whole family. URBENVILLE: Great for bush walking and 4wd enthusiasts. 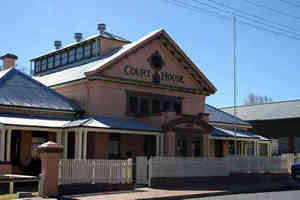 Tenterfield Shire boasts 10 state forests most of which are in the Urbenville area. Maps detailing drives are available. Fishing is popular along the many rivers and streams and there are excellent camping spots. TORRINGTON: Once a rich tin mining town, it is hard to believe that the remaining few buildings, piles of bricks and rubble represent what was once a thriving community. It still attracts dreamers with picks and shovels, but the many reserves and bush areas make for excellent walking and camping adventures. If you love the great outdoors - Tenterfield National Parks offer plenty of choices for everyone seeking to enjoy nature, walk, swim, picnic, camp and see the sights. 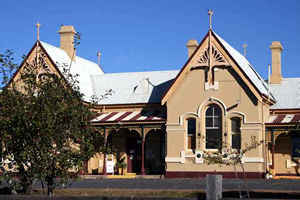 Tenterfield sits high in the New England tablelands and is surrounded by a rugged and scenic landscape of well-watered forests and woodlands. Bald Rock National Park – rises 260 metres above the surrounding bushland and is a massive 750 metres long and 500 metres wide – the largest exposed granite monolith in the southern hemisphere. Your reward for the climb is panoramic views across boulder-studded landscape – a gentle 3 kms circuit along Bundoonga Wallk saving the short but steep descent for the end of the circuit. Mt Lindesay Road is sealed from Tenterfield to Bald Rock. Only 15 Camping sites, facilities include toilets, BBQs. Boonoo Boonoo Falls National Park – (pronounced “bunna boonoo” meaning “big rocks). The Falls cascade over the eastern edge of the New England tableland crashing 220 metres into the rainforest and gorges below. An old gold field, Morgans Gully, can be visited while in the Park. Excellent swimming, camping and picnic areas – gas cooking galley under cover provided in both picnic and camping areas. Again – only 15 sites. Basket Swamp National Park – bush camping facilities are provided in this waterlogged Park. 200 hectares of heath and sedges cleans, stores and slowly releases water throughout the year into local creeks and eventually to the Clarence River. Access to Basket Swamp Falls, Timbarra Lookout and Woollool Woolloolni Aboriginal Place. Torrington State Reserve – South west of Tenterfield this reserve is situated on the Mole Tableland and is the largest area of native vegetation on the northern tablelands. Camping and picnicking are popular as well as bushwalking and photography – Thunderbolt’s Lookout and Old Mystery Face are must-sees. Tooloom National Park – Located 10 kms SW of Urbenville. Extensive subtropical and forest red gum stands protect this Park and provide habitat for the most diverse kangaroo and wallaby population found anywhere in Australia. A picnic area and walking tracks are located on the southern edge of the Park. Koreelah National Park – One of NSW most western rainforest Parks, there are pockets of World Heritage listed rainforest below Acacia Plateau and Mt Wilson while a small grassy area beside Koreelah Creek provides a pleasant camping spot. The Park is located 30 kms west of Woodenbong on White Swamp Road off the Summerland Way. Massive granite outcrops feature in this park with a big variety of bushwalks to suit all ages and fitness! Averaging from half an hour to 4 hours with the Pyramids a good climb. 120 campsites, gas BBQs in picnic areas, showers. Bookings essential in peak holiday periods – 07 4684 5157. High trap rock country with spectacular sharp ridges and steep sided gorges. Easy 2WD access from NSW to Broadwater Camping area – bush camping with donkey-boiler showers. 4WD to camp sites at Red Rock Gorge accessed from QLD. Bookings essential 02 6737 5235.